15 properties meet your choice. The Kobrova Residence is located on the southern slope below Petřín and a few steps from the centre of Smichov. In the middle of the 19th century, this area belonged to the summer houses of the rich Prague inhabitants among the balanced rows of vineyards, harvested fields and orchards. Today, the pulsating buzz of the city draws tourism and this residential part, despite the great changes due to the construction of the Strahov tunnel, uses its potential in the centre of Prague. Residence Kobrova is based on the existing urban structure. It is a compact addition to the block, which deals with the rising terrain and the height differences of neighbouring objects by the retreat of the last two floors in the direction of the descent of the terrain, which are completed on the 6th and 5th floor with loggias and terraces. The architectural design is an ideal combination of functionality, elegance and timeless appearance, with great emphasis on the high quality of finishing. The composition, shape, material and colour arrangement is quiet and neutral. The oversized windows and sun terraces will bring quiet urban living to the interior of each apartment unit. Kobrova Residence consists of 7 above-ground and one underground floors, offering a total of 15 units ranging from 1 + kk up to 5 + kk. A presentable entrance is located on the 1st floor of Graphická Street, the inner part of the courtyard is used for parking due to the sloping terrain. On the 2nd floor there is one apartment unit and six studios, which are exceptional due to spacious terraces in a quiet courtyard. A typical floor with two living units is located on the 3rd and 5th floor. The last two floors are receding and are made for generous family living with a terrace and loggia on a separate floor. The whole building is designed as barrier-free. The great advantage of this new building is the green surroundings in the courtyard. 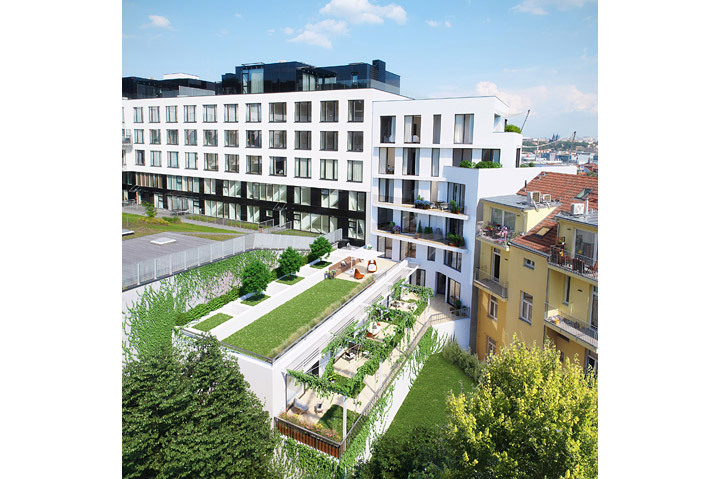 These are roof gardens with a combination of wooden terraces in front of entrances to individual apartment units, creating a quiet place to rest. The Kobrova Residence offers a practical and functional layout of high standard apartments, designed to suit the lifestyle of the 21st century. Residential units represent a number of innovative design concepts, each surface being designed to deliver the same amount of elegance and functionality.